Hi guys, we bring to you again the Big 5 Daily. 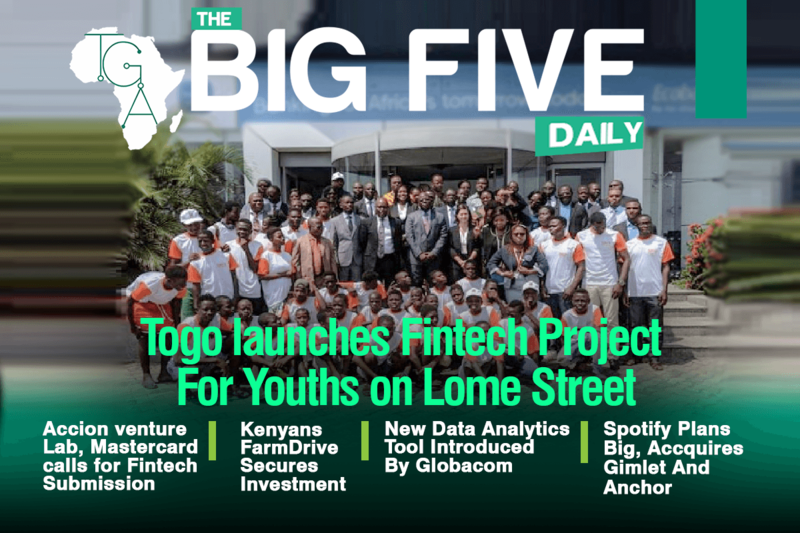 The Pan African Bank, Ecobank in collaboration with Terre des Hommes NGO launched a fintech project for youths on Lome Street Togo called Safe Savings (SaVa) and aims to protect children on the streets who have access to work but lack access to banking or financial saving services. The Sava project is a One-year test that will rely on mobile technology with the aid of Ecobank digital services. Terre des Hommes will act as guardians to the minors and will provide a “purse” per child, this will enable them deposit their daily earnings through mobile phones provided by the project. All savings will be in an Ecobank account. This is a good way to imbibe the saving culture in youths, don’t you think so? Moving on, FarmDrive, a platform that delivers digital loans and savings products to smallholder farmers in Kenya, helping them grow their income and flexibility has acquired more financing with which to provide credit access to over 3 million smallholder farmers in Kenya. This investment inflow will allow FarmDrive scale-up to 13 million USD loan origination this year alone with minimal exceptional returns and losses using Ripe (A lending engine that will allow lenders to plug in and access low-cost loan origination channels such as USSD, credit scoring, identity verification, and a portfolio management suite that includes recovery and collections, payments, customer support and advanced real time data analytics. Next on the Big 5 Daily, we have news that one of Nigeria’s biggest telecommunications company Globacom plans to introduce new data analytics tools which will aid capture subscribers real time experience. Alongside swapping of legacy facilities the Glo network company has invested extensively in network upgrades. They are also upgrading the capacity of microwave links, converting TDM links to IP for 2G and 3G and also releasing high capacity microwave backup links that will help increase data back haul capacity and protect traffic from fibre cut. They are also set to launch 5G in 700mhz band for IOT this year. This is really a big news for Glo network subscribers. Finally on the Big 5 Daily, Music streaming giant, Spotify has expanded into the Podcast market as it acquires Anchor and Gimlet media. Gimlet media, a podcast network and Anchor, a network that provides tools to build, publish and monetize podcasts for creators. Daniel EK Spotify’s CEO believes that this move will point up to 20% of Spotify’s listeners to non-music content in the future. We also have news that Spotify plans to acquire more podcasts in 2019 and that they are willing to spend over 500 million USD to grow. Recode reports Spotify paid between 230 million USD to acquire Gimlet Media. Interesting news! And that’s it for the Big 5 Daily, thank you for joining us.